At the southern end of a nearly 1,200-square-mile swath of wilderness, better known as Yosemite National Park, there’s a line of families waiting to take a single photo. It’s a spectacular sight, to be fair. The tangle of roots splayed out like an enormous wooden peacock dwarfs even the tallest of park guests. Children look especially adorable in its shadow. 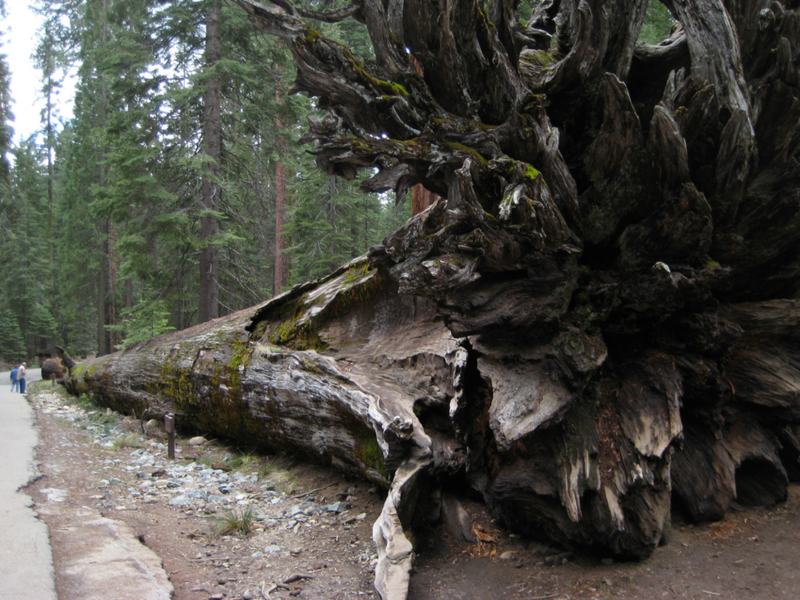 The trunk of this fallen behemoth stretches out beyond its upturned roots, so massive that a team of six horses and a stagecoach once posed on top of it. Never has a fallen tree looked so regal, which is perhaps why it was dubbed the Fallen Monarch. I see the temptation. It’s not just the thrill of disobedience, it’s the thrill of reaching the top. I like clambering up through knotted branches. I like dashing over steep rock faces. I like the views from the top and the satisfaction of getting there. I would love to sit at the pinnacle of this looming root system. But I don’t. The sign says not to. It’s not that I’m a blind rule-follower. I speed on the highway. I drank before I was 21. I’ve talked about Fight Club. So it might sound silly to draw the line at tree climbing. You might not be concerned that signs intended to preserve natural beauty are flouted every day. You might not be upset that clambering children are shattering pieces of a tree that died a hundred years before the United States was founded. But I am. During my time in Yosemite I observed a remarkably consistent pattern: The closer a landmark is to a parking lot, the less respect it is given. This may be because larger crowds make it statistically more likely that someone will be disrespectful, but I’d like to offer a slightly different view. If you go to a national park to see the sights located directly next to the road, you aren’t there to appreciate nature. This is not to say that you can’t witness some spectacular views from the roads in Yosemite. Glacier Point is one of the most beautiful vistas in the world, as is the Tunnel View; both can be reached without leaving the asphalt. But it is to say that respect for nature seemed to increase exponentially the farther I got from pavement. It is to say that national parks should have fewer roads and more trails. Forcing visitors to leave the comfort of their cars and venture out onto the open path is only forcing them to experience the nature they came to see. I’m not proposing that we eliminating roads from national parks, although that would make them more beautiful. I’m not Edward Abbey. Roads may be a necessary eyesore. Without them, most national parks would be inaccessible for all but the most confident backpackers (and perhaps a few foolhardy tourists). And yes, I realize that fewer roads make parks less accessible to park guests with physical disabilities. The unfortunate reality is that much of the natural beauty in national parks is already inaccessible for those people; Rocky trails do not lend themselves to canes and wheelchairs. So keep the roads. Keep the parking lots. Keep the toilets. Keep the information kiosks. Just move them a little farther away from the beauty we’re trying to preserve. It is a one-mile hike across mild terrain to reach Taft Point. Just one mile away from the public toilets and the noxious cars, you can take in sweeping views of Yosemite Valley from the top of a sharp cliff. You can see distant waterfalls, rock clefts and vast meadows. You cannot see signs asking you to respect nature because they are not needed here. No one is shouting to take the damn picture already or giggling about ignoring a sign. They’re appreciating what’s right in front of them. It would be a simple, if expensive and lengthy task to make it just slightly harder to reach these natural wonders. Hard enough to require motivation, but not so hard as to make them unattainable. The National Park Service has already begun this project. They are restoring natural beauty to the Mariposa Grove by moving the parking lot and roads farther south. It has long been one of the most accessible parts of the park, with constant tram rides delivering tourists directly to the gift shop. But soon the trams and the gift shop will be replaced with dirt trails and silence. When the grove reopens in 2017, I urge you to visit. But only if you like a good hike.